LG G6 is the first major phone of 2017 that we really want to see, and we may not have to wait until its expected MWC 2017 unveiling to catch a glimpse. Shiny, new LG G6 renders appeared online today, and while they're unofficial, they depict a phone that's shaping up to be more than a modular experiment. That's great news for anyone who wants to upgrade beyond the LG G5 and its few modular accessories that went nowhere. This phone wows in other ways. It's said to be encased in a 'highly reflective metallic material' and yet it may still be capable of wireless charging, according to the latest LG G6 rumors. Today's renders show a dual lens camera setup and fingerprint sensor on back, and we're expecting a 5.3-inch Quad HD display on front, matching the LG G5. Waterproof, but what about the battery? 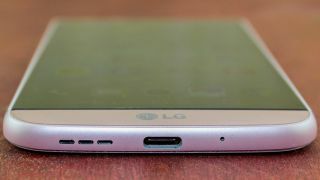 The LG G6 is illustrated to have a non-modular, airtight design, but one that still keeps the 3.5mm headphone jack and USB-C port open. It could very well be a waterproof – or at least water-resistant – LG flagship phone – finally. But that may come at the expense of the replaceable battery. LG has triumphantly touted its phone batteries as replaceable, when Samsung decided to get rid of the user-changeable battery starting in the Galaxy S6. Why the change? We may see significantly better battery life from a more power efficient Qualcomm Snapdragon 835 chipset, likely to be inside the LG G6. Couple that with Qualcomm 4.0 Quick Charge powers, and this new Android phone could recharge 20% faster than last year's phones. We'll know for sure at MWC 2017, and maybe hear about new rumors at CES 2017.